Pinterest has become an increasingly popular social media platform with businesses as a way of gaining more website traffic and potential sales. Not only that, but it’s perfect for photographers as it is a very visual and creative medium. If you haven’t already, I would highly suggest signing up for a Pinterest account. If you already have a Pinterest account then you might have found that over time your pinning has dwindled, website traffic has slowed down and your account now looks a little stale. So here are some tips to giving your Pinterest page a little makeover. There is some controversy over whether you should delete certain pins or not, so here is the general rule of thumb to help clear things up for you. According to Pinterest experts, your pins are most likely to be found if they have lots of repins. Therefore when you go through your various Pinterest boards, you should focus on removing those that aren’t doing anything for you. Of course, if you absolutely love a pin and you are intending to use it as inspiration for something in the future then don’t delete it just because it doesn’t have many repins. Things change over time, so another way to simplify your page is to go through your boards and see if any can be merged or removed altogether. For example, you might find that you started a board a while ago but never really pinned anything to it. If that’s the case then delete it. However, if you have a board for “canapes” and “wedding food” then you might want to merge the two. Make sure that when people visit your Pinterest page, they immediately understand your message, speciality and aesthetic. The boards near the top of the page should be examples of your own work and other subjects close to that topic. For example, if you are a wedding photographer you might have boards such as brides, grooms, flower girls, wedding food, wedding decor etc. It’s also a good idea to have an intentional image as your board’s cover. After all, this is one of the first things people see when they visit your Pinterest page. 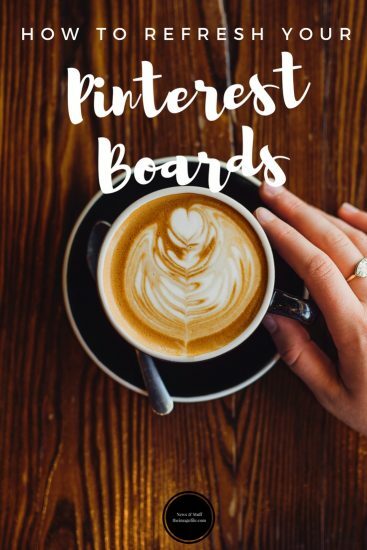 Try to choose cover photos that give a clear idea of what that board is about and look cohesive with your other boards. You want to give a consistent appearance so if you specialise in dark, moody commercial shots make sure that comes across on your Pinterest account. Find yourself uninspired by your Pinterest feed? Go through everyone and everything you follow and remove those that no longer align with your business or don’t inspire you. Once you have a clean slate, have a search for some new people to follow so that the next time you go to Pinterest, you have tonnes worth pinning.